The BOLERO is a Brown Out and Load Dump protection for Extended Reliability Operation. 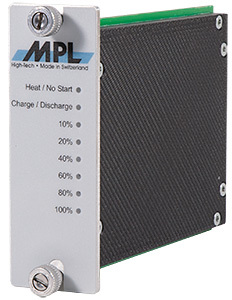 It is designed to protect the rugged MPL embedded computer (PIP/CEC Family) from various input voltage failures. This includes reverse polarity, over-voltage, load dump effects, and brown out (under voltage and power loss) failures. The BOLERO system consists of the BOLERO-1 and the BOLERO-BATT-1. The BOLERO-1 is responsible for detecting input voltage failures and switching to the battery, charging the battery, and communicate with the host system. It consist of a load dump and polarity protection, a battery charger and a CPU which controls the charger, the heater, and the state of the battery pack. To adapt the behavior of the BOLERO to the environment and power requirements of the system, a small set of configurable non-volatile parameters are implemented. The BOLERO-BATT-1 is the battery pack, designed with a fuel gauge, and a balancing and protecting circuit. The BOLERO-BATT-1 is equipped with a heat foil to extend the operating temperature down to -40°C. Since it is designed as plug-in module, the replacement of the battery pack does not require opening the housing, which makes maintenance easy. Included in the BOLERO-BATT-1 is a fuel gauge, giving accurate information about the battery's state of charge. This information is not only available to the operating system, it is also visible via LEDs on the battery pack front. A protective circuit prevents the battery pack from overcharging, deep discharge, over current on charge and discharge, and short circuit. It also incorporates a cell balancing device which controls and equalizes the voltage of each cell. The driver for the BOLERO runs on different operating system and allows remote monitoring of the system power state via Ethernet. The output power of the compact standard BOLERO solution is 10Wh, which is sufficient for 30 min. autonomy with an average PIP power consumption of 20Watt, or 15 min. with 40Watt. The perfect solution for any PIP currently available. The driver used for the BOLERO is the open source driver "apcupsd" (see www.apcupsd.com). This driver has the advantage of being highly configurable and is available for most major operating systems. Linux The driver "apcupsd" is available in all majors distributions. BOLERO-1 BOLERO Charger backplane with special mechanics to install in PIP housing (83mm & 120mm) Maintenance Monitor to track Battery status.